A dominant, hyperactive young female, very friendly towards people and empathetic towards her family. Her intelligence is above average and she has an all-round ability for any kind of work or learning. Her abilities to learn anything are outstanding. Dženika is immensely talented when it comes to hunting work, as she demonstrated during three weeks of professional training taught by Mr. Luňák, rounded off at the Autumn Club Trials with 1st prize and the title res. CACT. Her appetite for hunting work is unprecedented and has surprised many professional hunting trainers. Judge Linda Voláriková: "A female of an excellent type even in build, excellently shaped head, correct neck, excellent angulation on both side, excellent chest and fore-chest, correct topline, excellent gait, outstanding silhouette in both stack and gait." Judge Miloš Kašpar: "Strong skeleton, correct frame, outstanding head, straight back, correct movement, good coat structure." Judge Ing. Matyáš Jaroslav: "Female of a good type, solid build with well-shaped head, correct body structure." 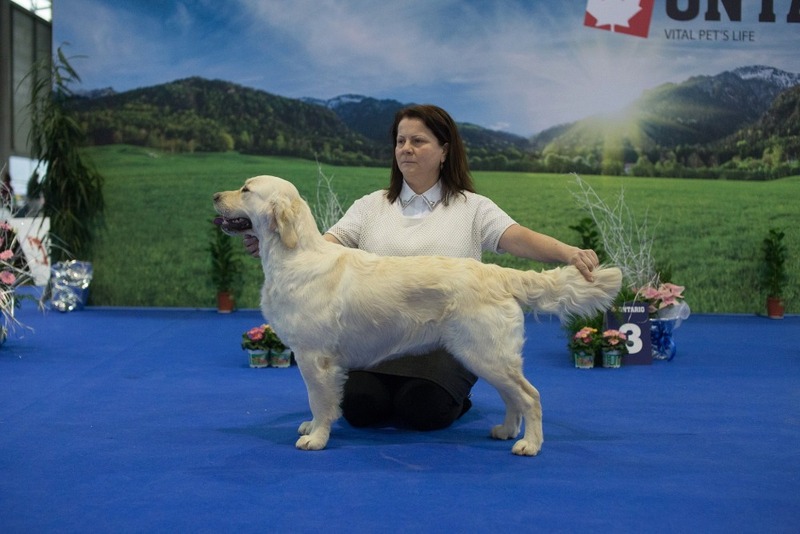 Judge Ingrid Grill (A): "Excellent female, correct bite, harmonious build, excellent coat, correct gait." My mom Jennifer Evidog with me and my siblings.